All praise is due to Allāh, and may the peace and blessings of Allāh be upon His Messenger Muhammad, his family, his Companions and all those who follow their path precisely. Indeed, the best of speech is the Speech of Allāh, the best of guidance is the guidance of the Prophet Muhammad (ﷺ) and the worst of all affairs are the newly introduced matters into the Religion (for which there is no textual proof) for every newly introduced matter is an innovation, every innovation is misguidance and every misguidance leads to the Hellfire. 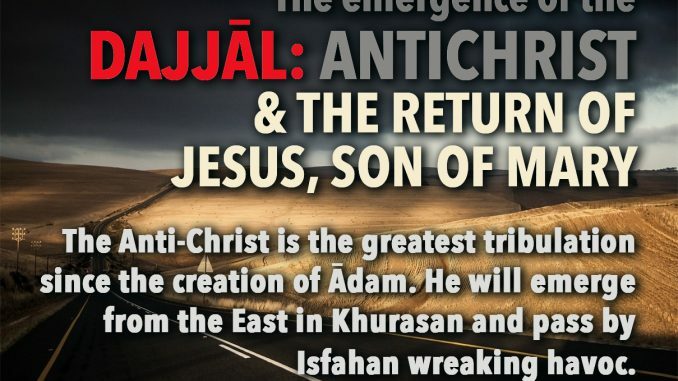 Ahlus-Sunnah wal-Jamā’ah believe that the False Messiah, the Anti-Christ, the Masīh Ad-Dajjāl will emerge and spread his tribulation across the earth. He will be one-eyed and the word kāfir will be written between his eyes. We believe that he exists and we believe in the authentic ahādeeth reported by the scholars of Hadeeth about him, that Jesus the son of Mary will descend and kill him at Ludd (Lod). Bukhāri and Muslim reported from Anas that Allah’s Messenger (ﷺ) said: “There was not a Prophet sent by Allah except that he warned his people from the Al-A’war Ad-Dajjāl, the One-eyed Liar. Indeed, he is one-eyed and your Lord is not one-eyed. There will be written between his eyes, the word kāfir.” (Bukhāri 7131, Muslim 2933) The ahādeeth concerning the Dajjāl are mutawātirah, that is, they are narrated by a multitude of narrators at every level of the chain of narration such that they could never have gathered to invent a lie, so its authenticity is beyond doubt. Muslim and Abu Dawood report from An-Nawwās Ibn Sam’ān (radiyallāhu ‘anhu) that Allah’s Messenger (ﷺ) said, “It is other than the Dajjāl that I fear for you. If he comes forth while I am among you, I shall contend with him on your behalf, but if he comes forth when I am not among you, each person must contend with him on his own behalf, and Allah will take care in looking after every Muslim even after I have gone. Those of you who live up to his time should recite before him the opening verses of Surat al–Kahf, for they are your protection from his trial.” We asked, “How long will he remain on the earth?” He replied, “Forty days, one like a year, one like a month, one like a week, and rest of his days will be like your days.” We asked, “O Messenger of Allah, will one day’s prayer suffice us on this day which will be like a year?” He replied, “No, you must make an estimate of its extent. Then Jesus son of Marry will descend at the white minaret to the east of Damascus. He will then catch him up at the gate of Ludd and kill him.” (Abu Dawood 4321) So this is the ‘Aqeedah of Ahlus-Sunnah as reported in the ahādeeth. “Jesus, seeing a man stealing, asked him, ‘Did you steal?’ He said, ‘No, by Allah besides whom there is none who has the right to be worshipped.’ So, Jesus said, ‘I believe in Allah and I will suspect my eyes.’” (Bukhārī 2444) Believing and loving Jesus is a binding part of the belief of the Muslim, and those Christians who become Muslims receive a double reward. Abu Musa Al-Ash’arī narrated that Allah’s Messenger (ﷺ) said, “If a person teaches his slave girl excellent character and manners, and educates her properly, and then frees her and marries her, he will get a double reward. 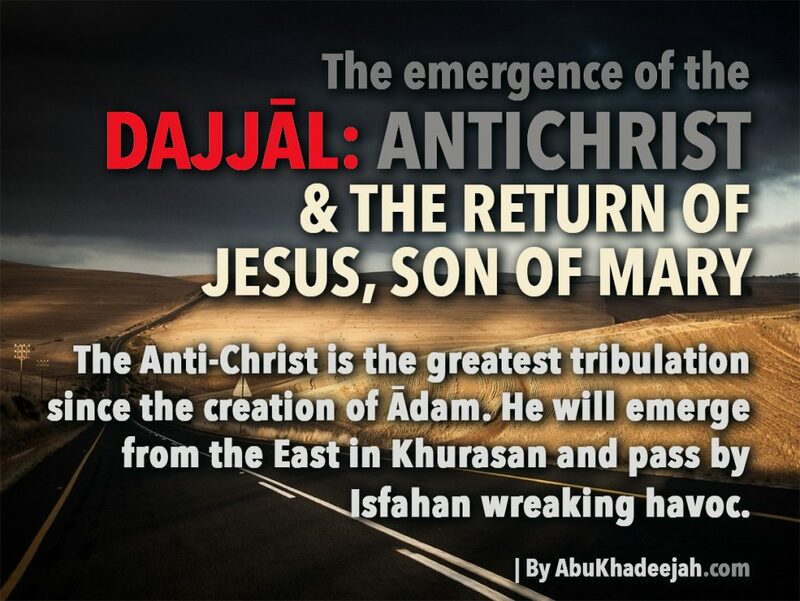 Where is the Dajjāl (Anti-Christ)? “The Dajjal will emerge from a land in the east called Khurāsān, and will be followed by people with faces like hammered shields.” (Ibn Majah 4072) And in a narration of Muslim, “The Dajjāl will be followed by seventy thousand Jews of Isfahān.” Isfahan is the capital of Isfahan Province in Iran, located about 340 kilometres (211 miles) south of Tehran. “I saw in a dream as if there were two gold bracelets in my hands which bothered me greatly. So, it was revealed to me to blow on them. So, I blew on them and they flew away. So I interpreted them to be two liars who will appear after me: the first is Musaylimah of Yamāmah and the second is Al-‘Ansī of San’ā.” (Tirmidhī, 2292, Sahīh) Both of them claimed prophethood during and after the Messenger of Allah (ﷺ). An-Nawawī said in his explanation, “As for her saying regarding the liar, ‘We have already seen him’ then she means by that Al-Mukhtār Ibn Abī ‘Ubaid Ath-Thaqafī (d. 67H) who was a severe liar. From his vile sayings was his claim that Jibrīl (‘alayhis-salām) comes to him. The scholars are agreed that the intent of the Messenger when he said, ‘The liar’ is Al-Mukhtār Ibn Abī ‘Ubaid Ath-Thaqafī, and the ‘great murderer’ is Al-Hajjāj Ibn Yūsuf (from Thaqīf…” Ibn Kathīr (rahimahullāh) stated in volume 8 of Al-Bidāyah wa-Nihayah under the biography of Al-Mukhtār Ath-Taqafī that, “His father embraced Islam in the time of the Messenger though he did not meet him… Al-Mukhtār was a Nāsibī who hated ‘Alī Ibn Abī Tālib (radiyallāh ‘anhu) with a severe hatred. He claimed that revelation came to him through Jibrīl (‘alayhis-salām).” The Rāfidah Shī’ah, however, revere him due to his seeking to avenge the killing of Husain Ibn ‘Alī at Karbala. What will the Dajjāl bring and with whom he will appear? May Allah protect us from the evil of those days. We seek refuge with Allah from the fitnah of the Masīhid-Dajjāl. We ask Allah to save us from the terrors of the Last Hour and from the terrors of the Day of Resurrection. We ask Him to shade us in the shade of His Throne on the Day when there is no shade except His shade and we ask Him to give us to drink from the reservoir of the beloved Prophet (ﷺ), his Hawd that is prepared for the Ahlus-Sunnah wal-Jamā’ah.